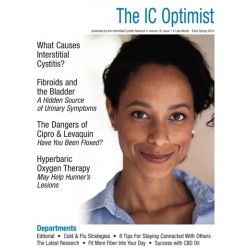 The Fall 2014 issue of the IC Optimist, a magazine for patients struggling with interstitial cystitis and bladder pain syndrome. (1) ICN Editorial - What are you willing to do to get better? 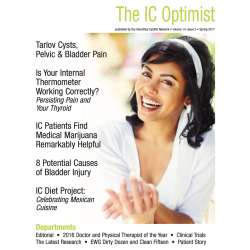 This issue begins with an editorial about a woman who, after years of struggling with bladder pain, admitted that she had never read a book, an article or even a website about IC. She was the epitome of a passive-aggressive patient who had refused to take action or responsibility to help herself. Hopefully, her story might inspire you to take that next step in your own IC journey. 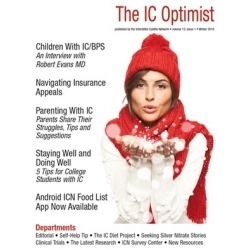 (3) Identifying The Subgroups of IC - ICN Medical Advisory Board member Robert Evans shares some startling new research results about the possible subgroups of IC. We thought that the distinct group was Hunner's lesions.. but it's not. (4) Big Step in Battling Bladder Disease - The most promising treatment currently under study is LiRIS which has been shown to heal the worst form of IC, Hunner's lesions, after just two weeks of treatment. This article shares the latest LiRIS news, including its acquisition by a major pharmaceutical company! (6) Related Conditions: Pelvic Organ Prolapse - Stacey Shannon offers information on pelvic organ prolapse, a condition which occurs when the pelvic floor muscles become unusually weak. 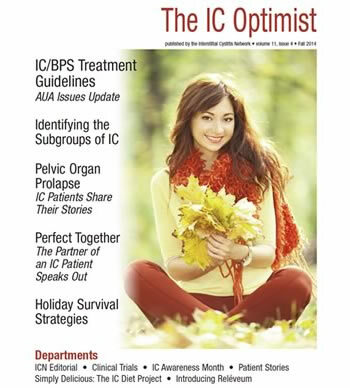 IC patients also share their story with vaginal mesh and the mesh recalls. (7) IC Awareness Month Highlights - We share one of the most successful projects in this years IC Awareness Month campaign - 30 facts about IC! (8) Self-Help Tip: Holiday Survival Strategies - If you're a newly diagnosed patient or veteran IC'er, the holiday season is often stressful, particularly when travelling is difficult. We share some simple self help strategies! 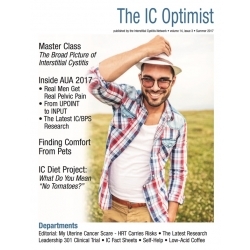 (9) Perfect Together - The Spouse of an IC Patient Speaks Out - New IC Optimist contributors Sean Luggi and Heather Undorfer share the perspective of a spouse of an IC patient. “Perfect Together” is a brutally honest love story of two people who, with candor and integrity, navigate the challenges of life with IC. (10) Simply Delicious, The IC Diet Project: The Things You Can Do With Squash - With the fall season comes some fabulous IC friendly foods. If you’re a pumpkin lover, you’ll have to try our recipes for Pumpkin Apple Streusel muffins and Pumpkin Drop Cookies with Cream Cheese frosting. Not looking for sweets? Then how about some butternut squash pasta sauce or soup? Simple recipes, great flavors and very bladder friendly! (11) What's New in the IC Shop: Introducing Releveum - Desert Harvest Aloe has introduced a fabulous new cream to treat sensitive, irritated and painful skin. From vulvodynia to shingles, this cream may help!